2nd Marine Aircraft Wing’s most recent aircraft arrival is something of a legend. Though it’s getting up there in age and has been around the block more than a few times, its June 3 (2009) arrival here has been the talk of the electronic warfare community. 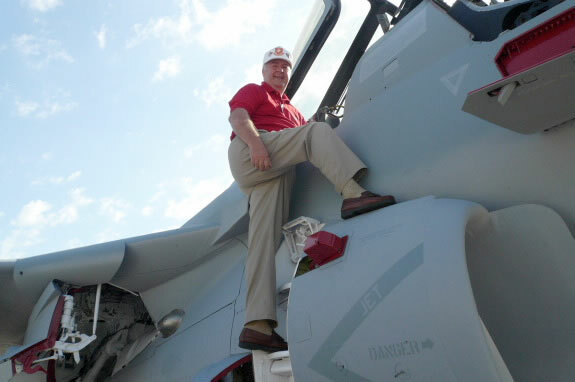 It is an EA-6B, bureau number 160432, and this will be the old bird’s last tour in the Corps – a tour that started over 32 years ago as the first Marine Prowler. Bureau number 160432 (with CY side number 000) made the first of many appearances over Cherry Point during a fly-in alongside its model predecessor, an EA-6A nicknamed “Methuselah,” Feb. 17, 1977. (The oldest EA-6A BuNo 147865 was flown by VMAQ-2 CO Lt. Col. Tim Fallon with MSGT Jack Deaton as his ECMO) A crowd gathered on the VMAQ-2 flight line on that sunny afternoon to witness what would soon become the future of Marine Corps electronic warfare. (VMAQ-2 held a formal squadron formation with then Maj.Gen P.M. Shutler, Deputy CG FMFLANT as guest of honor). 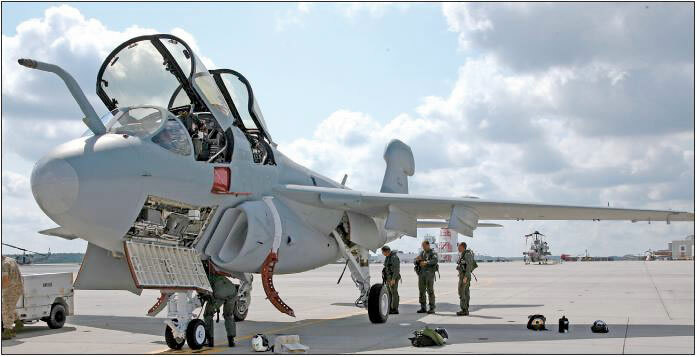 After its welcome here, the Prowler flew to Naval Air Station Whidbey Island where it was met by aircrews and maintenance personnel from Marine Tactical Electronic Warfare Squadron 2 (VMAQ Det Whidbey) commanded by Moore who were undergoing training with VAQ-129. Since its inception as a new production Improved Capability (ICAP-I), ‘432 has logged 10,737 flight hours and 8,489 landings, 447 of which were on aircraft carriers; two rebuilds and a slew of reworks and upgrades; and has supported operations in every clime and place, from Bosnia to the Persian Gulf. The aircraft, which is now officially the oldest flying fighter jet in the Marine Corps, is slated to deploy yet again to Iraq with VMAQ-1 later this year. 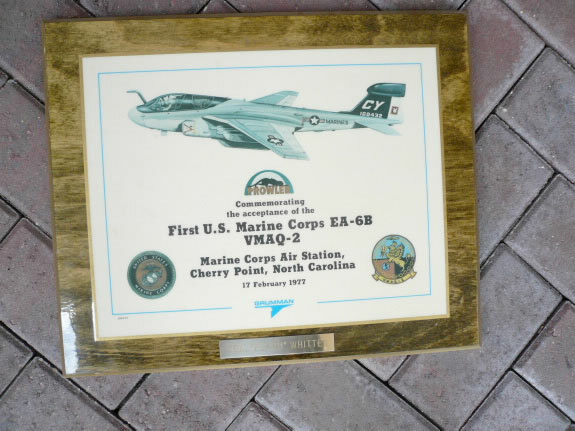 For Peel – who was able to witness the old Prowler’s recent homecoming on his 57th birthday – and other “old guys” in the EA-6B community, it’s hard not to get sentimental about the aircraft that established a significant chapter in Marine aviation. “I’ve been with these birds since the 1970’s, so that’s why they’re like babies to me,” Peel said. 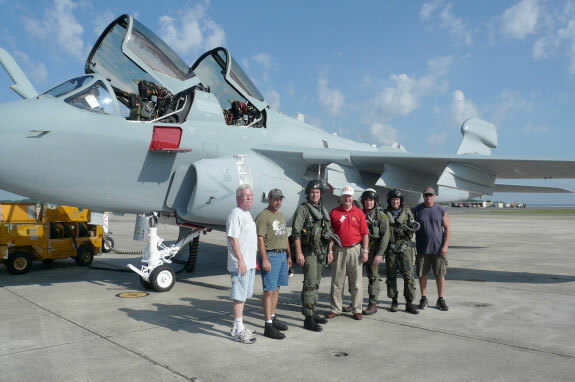 Col. Wayne “Flash” Whitten USMC (ret) with FRSC-SE EA-6B Check Flight team prior to final test flight of 160432 at NAS Jacksonville.